Here’s the slides from the panel I put together for the American Library Association Annual conference 2016 that featured Rebekkah Smith Aldrich, Ranti Junus, and Emily Clasper. Huge fun, really great response. Below the slides are a Storify of the tweets from the presentation…it’s a good representation of the discussion during our hour. Thanks to the Knight Foundation for helping put this together! Back in January, I did a few presentations at the ALA Midwinter conference. Two of them were recorded and I’ve finally tracked down the recordings and got them ready to post here. I only have slides for one, but hopefully someone finds the recordings useful. The two trends that I talk about are the Blockchain and it’s potential for decentralization of the web, and the confluence of AI/Machine Learning and autonomous agents as interface for data. The video below is a great presentation about Blockchain and its potential, by one of my compatriots at the Berkman Center, Primavera De Filippi. The tragedy of all online community spaces is that the goals of “inclusive” and “safe” are, at the extreme, mutually exclusive goals. Prior to the World Wide Web, I was an avid Usenet user, falling deeply into any number of alt. and rec. subgroups. Usenet was, in retrospect, where I learned so many things about “being online”, including tone, behavior, expectation….the entire culture of many parts of the social web were preceded and predicted by Usenet. Reddit is one of these spaces, as the concept and execution of a site that’s basically many user-driven bulletin boards is, in abstraction, just a modern execution of Usenet. Reddit has been in the tech news a lot lately, and while I’m not interested in debating the pro and con of the decisions that have been made there, I think it’s fairly obvious that there’s a lot of terrible things on Reddit and that the response to said terrible things has been horribly blundered. I agree with the ATP guys above in their analysis…if you want to build a horrible place, keep doing what you’re doing Reddit…but that’s not a place that non-horrible people will choose to continue to hang out. I think there are lots and lots of other online communities that have been ran very well and have managed to be smart and useful places to have discussions online…the premiere example of this is probably Metafilter. It isn’t clear if Twitter and Facebook will do as well over time dealing with their respective issues. In a way, a library collection is a conversation between the librarians and the community, written not letter by letter or word by word, but book by book over the course of decades or even centuries. That conversation is under the same tensions that online conversations are as it relates to safety and inclusivity. When someone challenges a book, they are in effect saying “this is a kind of speech that makes me feel unsafe.” And as Voss notes, the library gets to decide who to side with: those that feel unsafe, or those that make them feel unsafe. In the library, that answer is almost always the latter. This isn’t to say that there aren’t limits…each library draws its own limits of the things they are willing to collect. In my personal opinion, not collecting particular items is not problematic; for example, I would have no trouble as a librarian not purchasing nor shelving anything published by the KKK. I’m intentionally trying to frame this in the most difficult way, because I think it’s a difficult thing to navigate. Let me state my own position, straightforwardly: I think that the Library Bill of Rights is a positive document, and that the library providing access to material that the majority of their patrons would disagree with is absolutely fine. I also think that individuals deserve to be protected and feel safe in their activities and surroundings. The tension between these two positions puts me in a disharmony…I dislike being contradictory in my positions. It has been pointed out by those much smarter about these things than I that librarianship has inclusivity issues written deep in its core. While our collection development statements tend towards inclusivity of multiple perspectives on social issues, once purchased those collections are often described and presented to the community using a grammar that is anything but. For many public libraries, the Dewey classification system is massively problematic, and Library of Congress subject headings are no better. We have inclusivity issues baked into our classifications (indeed, it’s likely epistemologically impossible to categorize without exclusion of some sort). I don’t know how these issues get reconciled. How do you square inclusion and safety of spaces, both real and virtual? What are your thoughts on that dichotomy? Is it a false one? I’d love to hear from the library community about these seemingly opposing perspectives. At the end of this week, myself and about 20,000 of my librarian and library-adjacent colleagues will be jetting off to lovely San Francisco for the American Library Association Annual Conference. The conference is always a highlight of my year, and this summer is a particularly busy one for me. There are a bunch of responsibilities as a part of my Knight News Challenge project, Measure the Future, as well as my last set of Board meetings with LITA as Chair of Bylaws and Parliamentarian. If you want to schedule some time at ALA to talk to me about an upcoming technology consulting or speaking/workshop/presentation need, I’m all ears. Use the Contact Form over at Evenly Distributed or drop me an email or tweet and we’ll find some time to talk about how I might be able to help. If you’re interested in just saying hello, here are the places that you can find me at ALA Annual 2015! This is the first time that I will, if everything goes well, have a sensor demo for people to see regarding Measure the Future. I’ll be there to answer questions about the project, and talk about our goals and plans. I’m doing a one hour session at the 2 day library privacy and security event being run by the Library Freedom Project all about Tor, and how libraries and patrons can use it to protect themselves. The entire event is going to be bonkers good, so I’ll be there all day on Tuesday soaking it in. But if you wanna hear me talk about Onions for an hour, come see me. Aside from all of that, I’ve got a variety of meetings, gatherings, and shindigs I’ll be attending. If you poke around the available wifi SSIDs, I’m betting you’ll see my LibraryBox v2.1 beta unit wandering around Moscone…I’ll have a bunch of stuff on there for people to grab, including the vast majority of my writing from the last 5 or so years. Keep an eye out. I’m very excited about ALA Annual, and I hope you are as well. See everyone in San Francisco! I spent yesterday hanging out at the GigTank Demo Day, listening to 3D printing startups pitch their ideas and companies at investors. It was a fantastic event, as is normal for things that the Company Lab is running, and I had a good time listening to the excitement around 3D printing as a technology. It made me want to look back and see how long I’ve been following this technology, and I was dumbfounded to discover that the first mention of 3D printing on this very blog was in 2006. In October of 2006 I posted about a company called Fabjectory that was way ahead of the curve in providing 3D printing as a service for people. Then, not quite a year later I held the first 3D printed object that I’d ever touched, and it happened to be a print of myself as a Nintendo Mii. That was in August of 2007! In 2011 I was asked to record a video by the LITA Top Tech Trends committee as an experiment for doing some information updates on technology between ALA Annual and Midwinter, and the trend I pointed to was 3D printing. There’s a lot more that I’ve written over the years, ranging from my interviews with Bre Pettis (CEO of Makerbot Industries) about libraries and 3D printing to reporting last year for American Libraries on the 3D printing news from CES 2014. 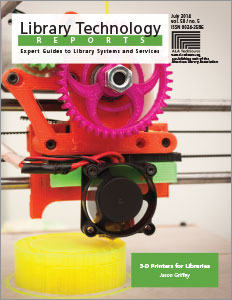 All this time and interest in the technology is coming to head in the publication of a new Library Technology Report that I have written on 3D printing, called 3D Printers for Libraries. In it I explain all of the varieties of 3D printing and 3D printers, from the inexpensive fused-deposition printers that most libraries are installing to the highest end Electron Beam Melting printers that are used to produce medical-grade implants. I go through the pros and cons of a variety of manufacturers, and make suggestions for libraries who are just getting started in offering 3D printing as a service. If your library is looking at starting to offer 3D printing, this is a good reference work to help you make some decisions about types of printers and pitfalls and problems you may see with them. If your library would like some help in making decisions like this, or in figuring out how to offer 3D printing to your patrons, feel free to contact me (griffey at gmail.com or @griffey on Twitter). I’d love to help you get to a place where your staff is confident in offering 3D printing as a new technology offering from your library.